This course is about measurement of the flow rate of a fluid flowing under pressure in a closed conduit. The closed conduit is often circular, but also may be square or rectangular (such as a heating duct) or any other shape. The other major category of flow is open channel flow, which is the flow of a liquid with a free surface open to atmospheric pressure. Measurement of the flow rate of a fluid flowing under pressure, is carried out for a variety of purposes, such as billing for water supply to homes or businesses or, for monitoring or process control of a wide variety of industrial processes, which involve flowing fluids. 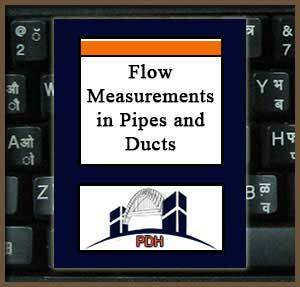 Several categories of pipe flow measurement devices will be described and discussed, including some associated calculations. Be able to calculate flow rate from measured pressure difference, fluid properties, and meter parameters, using the provided equations for venturi, orifice, and flow nozzle meters. Be able to determine which type of ISO standard pressure tap locations are being used for a given orifice meter. Be able to calculate the orifice coefficient, Co, for specified orifice and pipe diameters, pressure tap locations and fluid properties. Be able to estimate the density of a specified gas at specified temperature and pressure using the Ideal Gas Equation. Be able to calculate the velocity of a fluid for given pitot tube reading and fluid density. Know the general configuration and principle of operation of rotameters and positive displacement, electromagnetic, target, turbine, vortex, and ultrasonic meters. Know recommended applications for each of the type of flow meter discussed in this course. Be familiar with the general characteristics of the types of flow meters discussed in this course, as summarized in Table 2 of the course content.